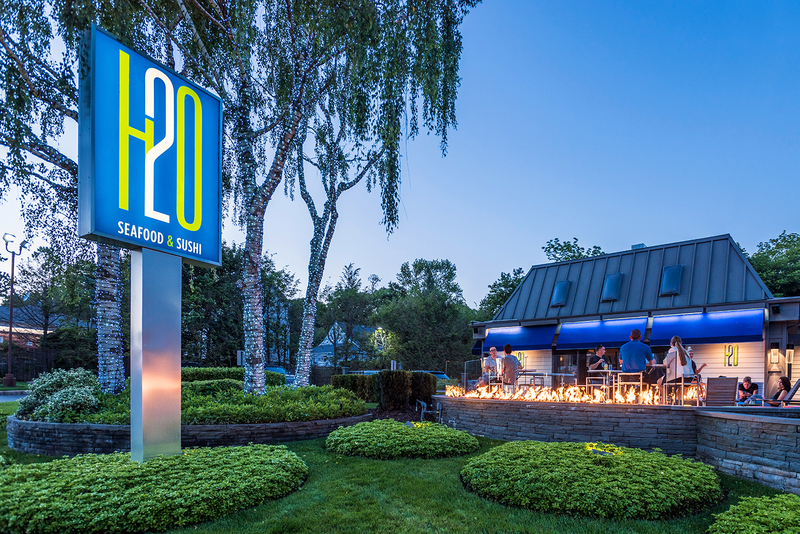 H2O – Seafood & Sushi in Smithtown showcases seasonal seafood, served with passion, conceived with creativity. The sea dictates what’s on the menu at H2O. Whenever possible, our chef sources local fish and supports local farmers through creative takes in the kitchen. Grab a seat at the expansive gray marble bar while tasting fresh sushi or our modern American seafood classics. The sprawling menu not only features treats from the ocean, but also satisfies land lovers with dishes like our flat iron steak with Sriracha butter and onion rings or our pan roasted chicken with cornbread stuffing. Shareable desserts like the donuts with coffee pot du crème make indulging almost impossible to avoid. Cleverly designed with an upscale New England feel, you’ll feel right at home in this warm and inviting space. Weekly specials provide opportunities to taste the eclectic menu, from Lobster Monday to Surf & Turf Sunday. Wednesday Night Wine Dinners showcase curated pairings of wine carefully selected to enhance each course. H2O was recently voted #1 Overall Seafood Restaurant in the New York Area on OpenTable.